a muslim homeschool: Create your Ramadan Action Plan with this fun family activity guide! No matter the ages of your children, your Ramadan aspirations are not a secret from them. Talk to the kids about how important striving to do good over the month is, and get them in on planning their own good actions. What do you yourself hope to achieve? Think about what challenges you might face in reaching your own desired outcomes. What potential solutions can you prepare to help you overcome them inshaAllah? What difficulties might the children face and how can you help surpass them bi’ithnillah? 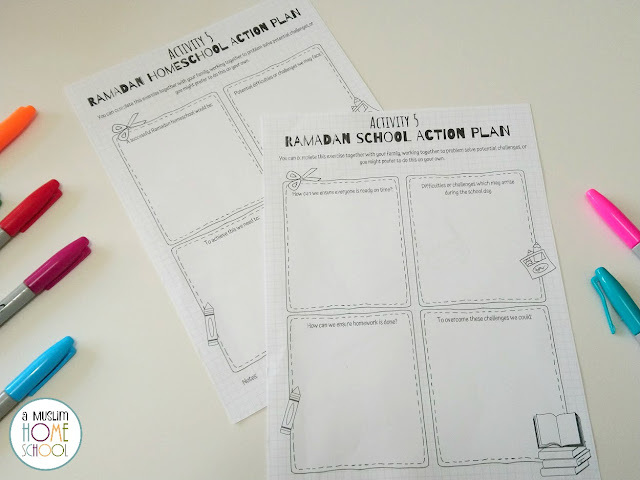 If the kids are in school but you all want to pray Tarawih at night, what will make getting everyone ready on time in the morning easier? What can be done to prevent fasting kids having late afternoon melt-downs because of tiredness and hunger? How can you organise your time so that you're able to take care of everyone's needs as well as take care of your own ibaadah? Identify all your potential challenges and have a list of solutions ready. 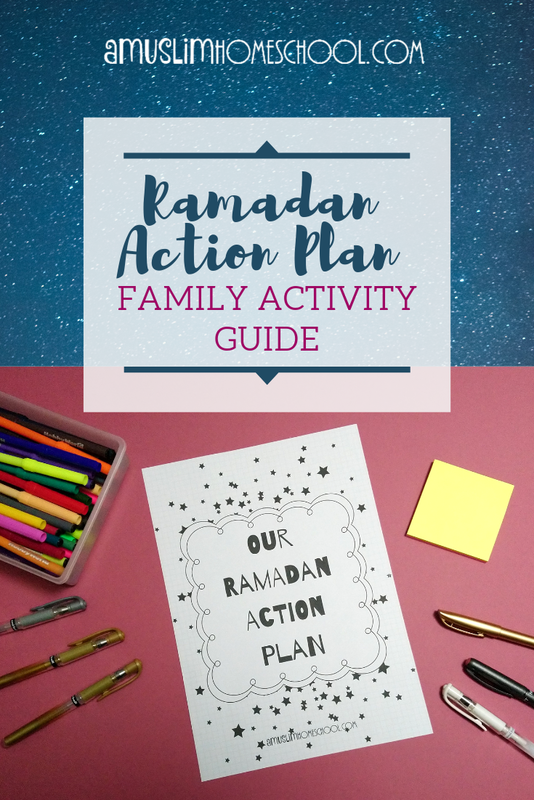 This Ramadan activity guide will help you and your family talk about these matters and help you to find answers to your difficulties. I've shared some images but I have to hold my hands up...my camera quality is really poor. I feel I have to state the obvious so we can ignore the obvious! Activity 1: Sticky note fun; what are your family's Ramadan aspirations? The first activity invites you all to start thinking about Ramadan; what it is, why it's important and what you all hope to achieve. 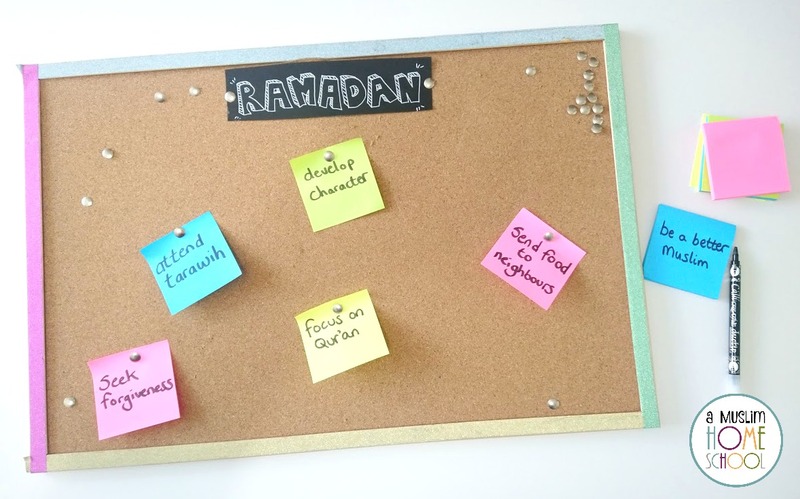 All you need to do, is grab some sticky notes, a cork board or large sheet of card...even straight onto the wall, and ask everyone to jot down what they know about Ramadan and what they'd like to work towards inshaAllah. Normally, us Mums think about these things on our own. We look at what we'd like our kids to value and achieve over Ramadan, and try to steer them in that direction. 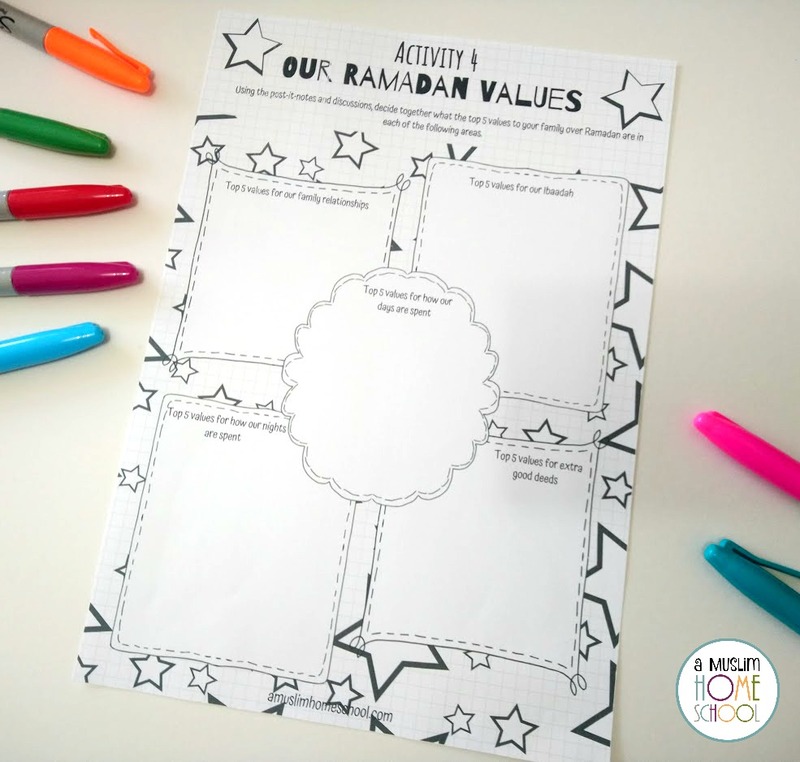 However, with this simple activity you're able to invite the whole family to participate in creating your Ramadan plan, asking them to think about its purpose and digging deep to look at what each of you would like to achieve. By getting everyone involved like this, you'll get a greater level of interest, excitement and efforts because you're prompting the family to think about and reflect on their own purpose. When every one has had a hand at sharing what is important to them, you'll get a greater level of investment from them. This second exercise, follows on from the first. During the sticky-note activity you probably already were able to generate a lot of conversation around Ramadan. However here, you're going to take a look at each of the sticky notes, and explore them further. Why are some of these points your children have written down important to them? Why are yours important to you? Next you're going to brain-dump all your good deed ideas that you might like to try over Ramadan. Listing them doesn't mean you have to go out and do every single one. But it will allow you to pull together possibilities to encourage your family to take certain steps to work towards accomplishing them bi'ithnillah. You're a busy mum with a busy family life. 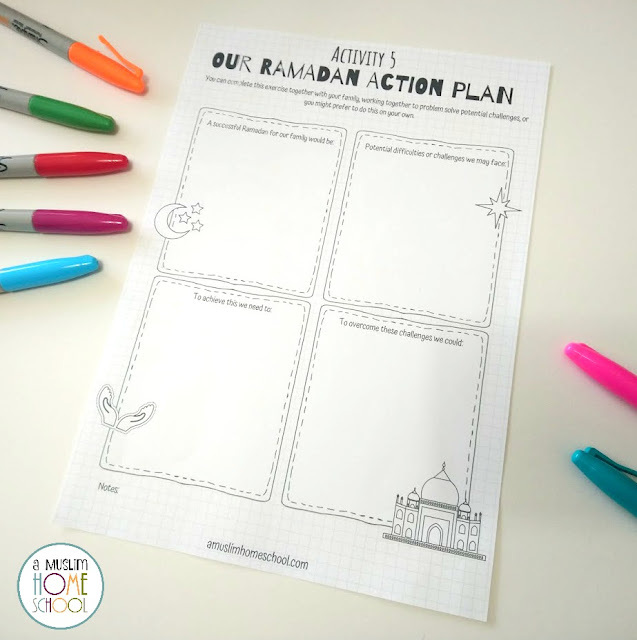 Whilst absolutely you want to do as much as you can over Ramadan and encourage your family, so many of us get overwhelmed at wanting to do so much out of the ordinary that it can become easy to feel lost. By listing out your top 5 priorities in each area, doesn't mean you're limited to these. But it means you can put things into place ahead of time to help you accomplish them inshaAllah. 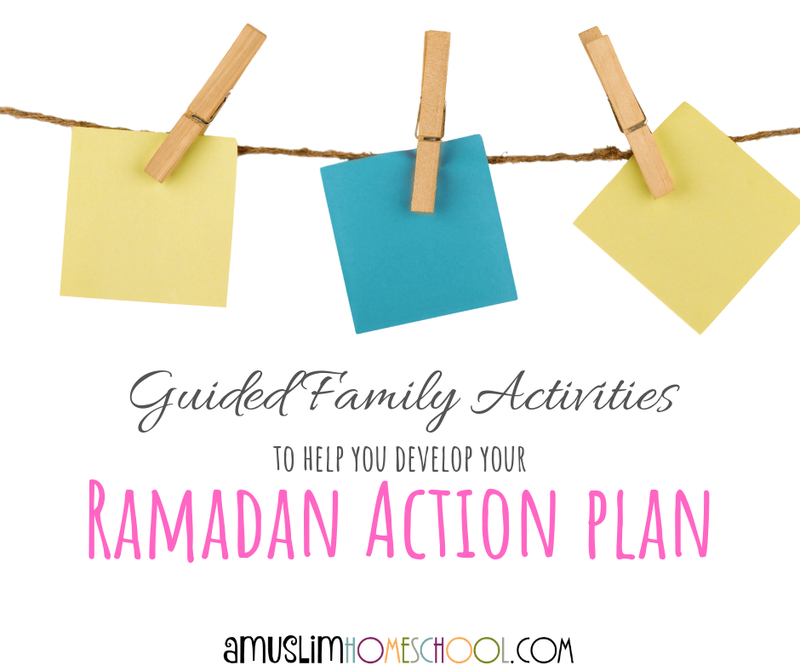 The last activity, you'll identify what a successful Ramadan for your family would be, and think about practical strategies to help you achieve that bi'ithnillah. You'll also address any potential difficulties or challenges which may come up and look for solutions. You'll also look at your homeschool or school, and think about how you can overcome potential difficulties....there are two sheets for this activity, so only print the one you need (whether you're a school or homeschool family). Looking for other Ramadan activities? 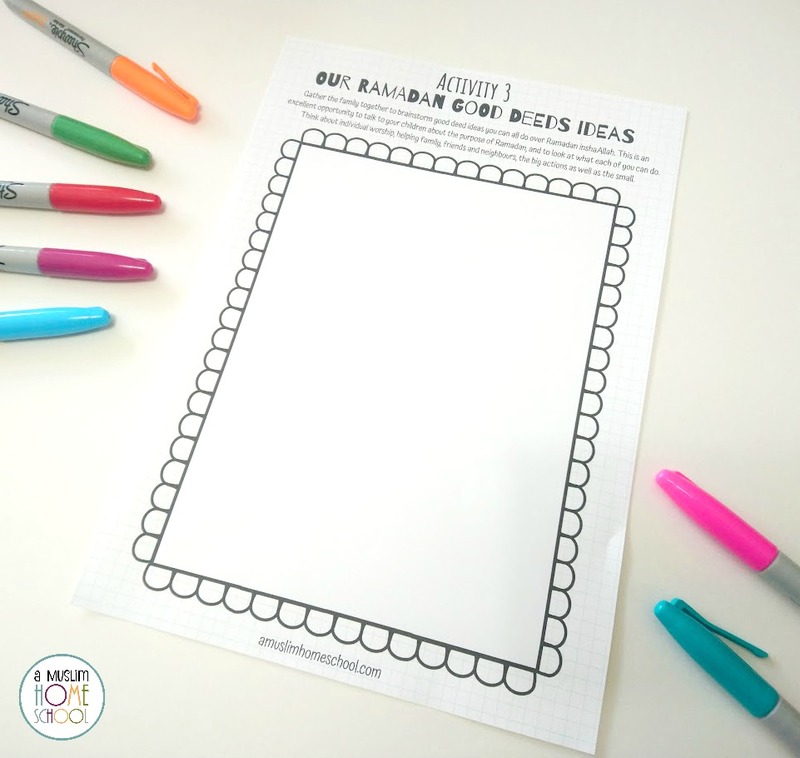 The best kids Ramadan Journal. 30 days of Ramadan ahadith cards.